Weather cleared during morning. During hut inspection lost _____ . Days getting rather monotonous but cannont definitely make up mind about extended leave. Received note from Jim (Wootton) – still camped outside Meena. Bad weather returned again – worse sand storm since arriving here – several of the tents & walls blown down. Cleared gradually towards late afternoon. Received first mail (5 letters) from NZ for over five weeks. Began writing to Marg (his girlfriend) during evening. While on guard duty early morning VAD’s (Voluntary Aid Detachment) Mess tent caught fire – disappeared within a few minutes. Spent morning cleaning tent after previous sandstorm. Afternoon read. Night off. Played house then continued writing. Arose this morning for breakfast – first time in a week – then returned to bed. Roy Sutton came in at 8 o’clock – leaving for rest house at Alex. In afternoon received No 34 parcel containing biscuits. Did not play housey tonight as saving for leave so continued writing. During night drizzled a little. « Wordless Wednesday – Batman! ???? Day 728 . . . . Days getting rather monotonous but cannon definitely make up mind about extended leave. I think the word is cannot rather than cannon. Wow, this is so cool! Thanks for sharing your granddad’s journal with us. My granddad was a gunner in the Navy and served in the Pacific and European arenas. He left a journal, but it didn’t occur to me to post excerpts. Great idea. So glad you found it. Its a really interesting project and I’ve learnt a lot and am enjoying doing it. 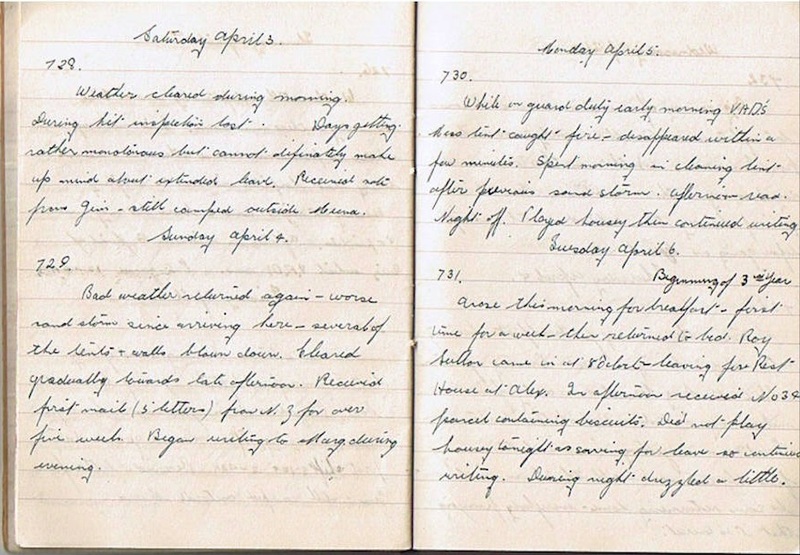 Please do digitise and share your Grandad’s diary. If nothing else to ensure that there is a permanent copy elsewhere – that was my main goal so others could read it but to also allow extended family to read it. I’m planning once done to collate and provide to family in electronic format to share with their children. Those are great ideas! My family would be over the moon if everyone got a copy of the journal.